We can supply and fit various roll cages from basic 6 point items to multi point weld in cages. We can also modify and add to existing roll cages to add in additional sections such as extra diagonals, door bars and extra sections to connect to suspension turrets and pickups as well as harness bars and floor anchors. 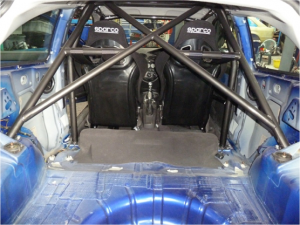 Over the many years of fitting roll cages we learnt it takes great skill to fit a modern roll cage to a car that was never intended to have one. Over these years we have developed a wealth of knowledge on the real requirements to the design and fit of a good quality roll cage.